As someone who was called an “underdog” (a person with less power, money, resources, etc. than the rest of society and little chances of getting ahead of the game), I can tell you that it doesn’t really matter what other people say as long as you believe in yourself. If you believe in yourself and your abilities it is a great start to learn something new every single day and start the journey of self-improvement. I don’t think I have always been mentally strong but during tough times you can really see what you’re made off. If I want something, I have learned to hold on to it like a dog to the bone. Have I ever felt sorry for myself? Oh yes!!! Blaming, moaning, whining, crying, close to depression – I have experienced it all. However, at some point I realized that playing the victim doesn’t serve me. “Snap out of it Karin” is one of my key phrases. Have I expected faster results than I was able to achieve? Yes but I have learned that everything worthwhile achieving will take some time and some effort. There are no shortcuts on your way to excellence. Have I ever felt hurt about how other people treated me? Yes, yes, yes! There were people who told me over and over again, “call me next week again” or “now is not a good time but in 6 months we will get started”. What I didn’t know at the time was that these people had absolutely no intention of doing business with me, they just wanted to get rid of me and they didn’t think I would call again after 6 months. However, I did and this made me so resilient you wouldn’t believe. Have I ever been stuck in the mindset that I have to please every prospect and give them what they wanted? Yes. However, these days I have amounted the courage to say “no” if it isn’t aligned with my mission and my values. I have learned something from every miserable situation I have been in and it paid off. If I could do that, you can as well! 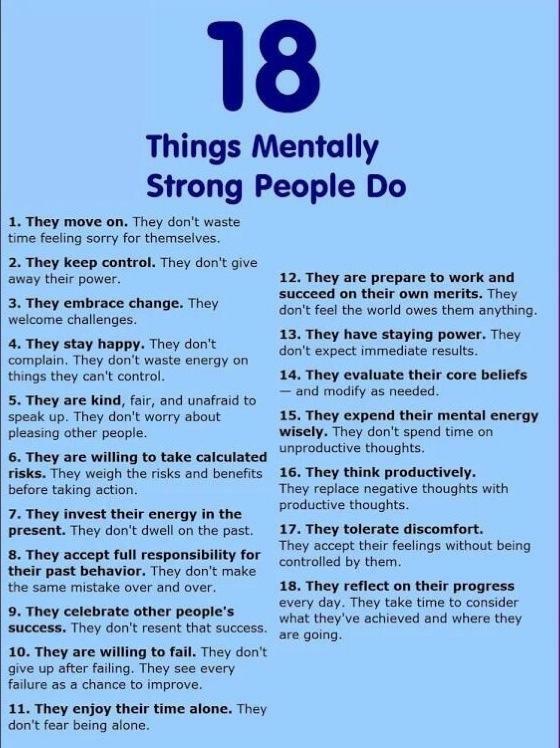 Over the next few days (maybe weeks) I want to spend more time on mental strength strategies and how YOU will be able to live a happier, healthier and more productive life. Here is how it works….. Reading my messages is not enough. Taking action is important. If you wait for someone else to improve your life circumstances, you will wait for a very long time. If there is something that you would like to improve and it speaks to you through my messages, make it your personal mission to become a little bit better each day. Push yourself out of your comfort zone because that’s where the magic happens. I thought so. Let’s do this TOGETHER. See you tomorrow again. Point #12 has a grammatical error in it. I believe it should read ‘prepared’ and not ‘prepare’.